Imagine. Life is just humming right along that is…until 13-year-old Abigail asks to stay out until midnight. Seems some of her friends have planned to hang out at a local movie theatre. According to her, everybody will be there and leaving before midnight would totally make her look like a major loser. More often than not those words are uttered in the heat of the moment. Maybe you’re having a disagreement over how clean a bedroom really needs to be or perhaps you’ve been told in no uncertain terms how lame you are because you won’t say yes to rated “M” (for mature) video games. Kids may tell you how they covet the multitude of freedoms they have when they are with Dad or how very cool Mom is because she lets them text at the dinner table. So what do you do when your little bundle of joy demands to live fulltime with their other “more fun” parent? Be mindful that every self-respecting kid at one time or another will test the waters. When kids are angry or upset about a rule being enforced, they may use the threat of changing households as a way to get you to back down. For other kids, hitting you where they know it hurts, is just another way of acting out their anger. Whether it’s to gain an upper hand or to show you how really pissed off they are, do your best not to take what your child has said at face value. Okay, let’s be honest. Who hasn’t secretly fantasized about shipping their child off when they are in the throes of a temper tantrum or emotional meltdown? While fantasizing is fine, using a shape up or ship out threat typically results in more problems. First, it sends a pretty clear message that you don’t have control. Keep in mind, when kids figure out you don’t mean it (and most of us don’t) chances are they aren’t going to value or respect the other issues you take a stand on in the future. Second, it’s quite possible your kids may also interpret “I’ll just send you to live with Dad” as your love is conditional (i.e. “Do what I say or you’re out of here.”). Either way it compromises your credibility as a parent. As hard as it may be, don’t match your child’s anger or engage in a discussion about changing the living arrangements. Even though you may be seething, do your best to give the appearance of being calm and collected. If needed, take a deep breath before addressing your child’s request in a matter of fact way. On another note, if you find you’re having a strong reaction to what your child has said, it’s probably best to put things on hold. Odds are nothing good will come out of talking to your child when you’re feeling hurt or angry. Instead, let your child know you need some time to think about what has been said and step away from the situation. Consider going to another room or taking a walk outside. Once you’re in a better place, give thought to what set you on edge and how you want to address the issue with your child. If you have a more traditional parenting schedule, be aware that at some point your kids may want to know what it would be like to spend more time in the other parent’s home. When children express a sincere interest that is not motivated by anger or upset, as parents, it’s important to pay attention to that. Whether you are under one roof or two, as our children’s needs change, so must our parenting. For example, it’s very normal for a teenage boy to crave more day-to-day contact with his father. A young girl transitioning into her tweens may really benefit from spending extra time with Mom. Although it can be scary as hell to think about changing your parenting arrangement, do your best to keep an open mind. When have you heard the words, “I want to move out and live with my other parent!” If so, what did you do to head off your child’s angry outburst? Have a story, tip or comment to share with other parents, feel free to post below. Look forward to hearing from you. Feel overwhelmed by divorce drama? Exhausted by ongoing conflict? Worried that you’re kids won’t be okay? 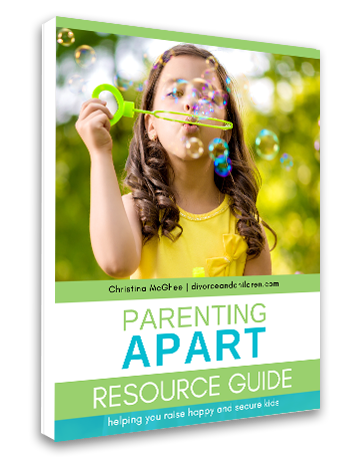 GET solutions and support at divorce and children or check out my new book Parenting Apart: How Separated and Divorced Parents Can Raise Happy and Secure Kids. Have a question or comment? Join our growing parent community on Facebook or follow me on twitter. I just had this happen to me in front of my ex wife. My daughter had a bad dental appt and has to get some work done. She often refuses to brush her teeth at her mother’s house. I pointed this out and explained how her behavior contributed to her cavities. She started crying ran to her mother and said she didn’t want to go back to my house. She’s only 9 but a giant drama queen when with her mom. I don’t know what to do. I’m shattered. of course her mom did nothing to correct her behavior, just coddled her. I mean, just a month before she wrote an essay about all the things I’ve done to help her grow as a person. I responded that what she said was foolish and I didn’t want to hear it again. Maybe not the best thing to say after reading your article. But the kids have admitted in the past that they have been told/coached to say things like this. I’m terrified of more court dates and expense.